Was Dubya really prez for eight years? You see George W. Bush on TV now, and you wonder: Was this guy really president of the United States for eight years? There he was, just the other day, being interviewed by someone from the Hoover Institute, reminiscing about his tenure as president. Dubya, wearing a nondescript brown sports jacket, is rumpled and a bit sleepy, like he just got up from his afternoon nap. The bland interviewer looks like a fake newscaster on a commercial hawking an amazing new male-energy pill. Trying to seem impressed and energetic (but obviously asking himself, was this guy really president of the United States? 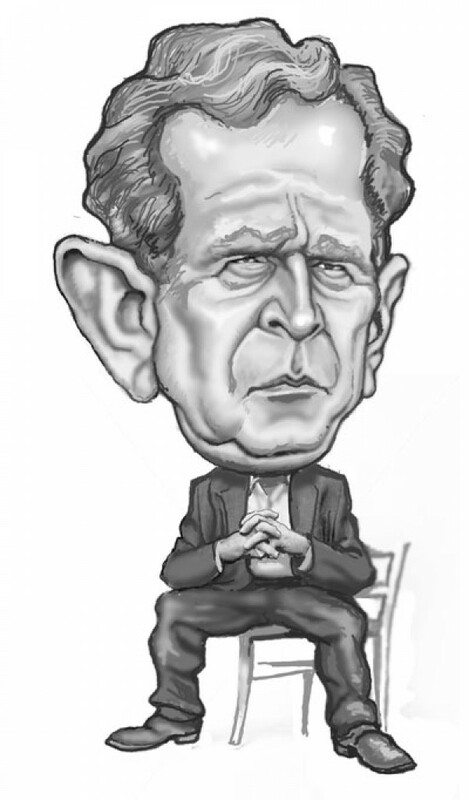 ), the interviewer wants to know if Dubya missed public life. The former president, as usual, looks very uncomfortable, his deer-in-the-highbeams eyes darting this way and that. He does some self-conscious stuff with his face muscles as he searches for words, then stammers out his answer. “Eight years was awesome, and I was famous and I was powerful.” Awesome George makes this statement in a distinctly unenergetic manner. Eight years was awesome. Not that we should expect a statement worthy of Thomas Jefferson, or even Jerry Ford. But as Awesome George might himself say, the answer is pretty lame. On second thought, the Bush years were pretty damned awesome: hijacked elections, fictional weapons of mass destruction, Darth Cheney, tax cuts for rich guys who don’t pay taxes anyway (like Willard “Mit” Romney), the housing bubble, corrupt banks, financial catastrophe that brought our nation to the brink of destruction. Awesome, indeed. Throughout his awesome administration, Dubya was the object of well-earned ridicule. But on some level, there was some grudging affection for this Mr. Mumble Bumble. Maybe it was because he was so inept, so inarticulate, so clumsy, so touchingly moronic in his predictable gaffes. He was not “misunderestimated” at all. We, his subjects, estimated very accurately his level of competence. We had his number. Every day brought new comedy: Dubya mistaking his left hand for his right; Dubya butchering clichés (Fool me twice … you ain’t going to fool me again); Dubya pawing the shoulders of the horrified German chancellor, Angela Merkel; Dubya exiting a stage in the wrong direction, pulling desperately on a locked door; Dubya dodging shoes at a news conference. It was hard to summon up feelings stronger than pity or mild contempt for Awesome George, the class dork who laughs too hard at his would-be jokes and tries to sell you life insurance at your high school reunion. It’s not much of a stretch to feel superior to Awesome George. Is there anyone out there who has strong feelings of any sort toward our former and almost forgotten president? The general indifference to Awesome George—now reduced to protesting, too much, his fame and power—this ho-hum reaction to the man, despite the fact that he royally forked up our country, presents us with an instructive contrast to the frightening hatred a disconcertingly large segment of the citizenry feels toward the current occupant of the White House. The easy answer as to why the Foxed-up ditto-heads hate Obama is that he is black. But worse than that is the galling fact that he is smart, cool, graceful, witty, etc. Uppity, if you like. Unlike Awesome George, Barack Obama is truly a superior specimen of the species. This is hard for a lot of people to take, people who not all that long ago, could take solace from the fact that they were “better” than segments of the citizenry who were deemed inferior simply because they had skins of a different color, the result of some Biblical curse or punishment because of proving to be less than valiant in some religious story of the pre-existence. The resentment and contempt, if not hatred, toward Obama can be detected in the behavior of those who should know better, and who pride themselves on being fervent defenders of our American way of life. There are those on the political scene who are mightily annoyed that someone like Barack Obama is president. Even a man like Mit Romney, who has emancipated himself from his religion’s erstwhile discrimination against black people, betrays on occasion a self-righteous indignation that someone like Barack Obama, a European socialist with foreign ideas in his head, has been called to fulfill an important office in the divine plan for America. Meanwhile, Awesome George annoys Laura by hanging around the house when he isn’t hanging out at the hardware store telling folks that he used to be famous.